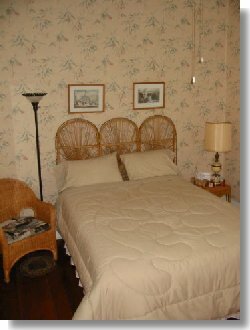 At the Spotted Dog Bed and Breakfast we have three beautiful guest rooms, plus a number of public rooms for our guests to enjoy. All our guest rooms are priced the same. 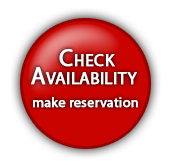 See our rates page for details. The Woodhouse room our dog-friendly bedroom - it's large, comfy, inviting and relaxing - and allows you to bring your four-footed friends along with you on your quiet country getaway. 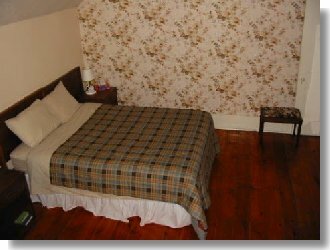 This room features one queen-size bed and one twin to comfortably accomodate up to three adults. Click here for more views of the Woodhouse room. The Somerset room is one of our favourites. 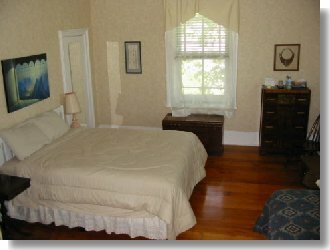 A little smaller than our other guest rooms, it amply accommodates a queen sized bed and a small sitting area. With it's high ceilings, wicker furniture, ceiling fan and large window, this beautiful, quiet room brings to mind relaxing times in exotic locales. This is an ideal room for one or two adults. Click here for more views of the Somerset room. The Hastings is our largest room. It's whimsical country charm is both restful and delightful. This room features high ceilings and four large windows, all of which contribute to its wide open airy feeling. One queen bed and two twins will comfortably sleep up to four adults. Click here for more views of the Hastings room.